Interested in doing business with four of the largest businesses in our region? Home / Chamber Announcements / Interested in doing business with four of the largest businesses in our region? 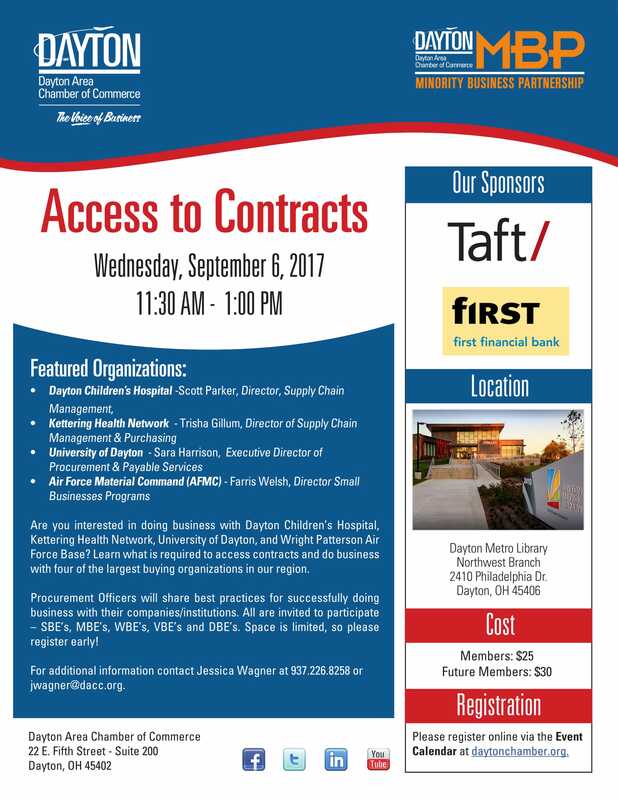 Then you might be interested in the Access to Contracts event hosted by the the Dayton Area Chamber of Commerce on September 6, 2017 from 11:30 am until 1:00 pm. This exciting event, will help you learn what is required to access contracts and do business with Dayton Children's Hospital, Kettering Health Network, University of Dayton, and Air Force Material Command (AFMC). The cover charge will be $25.00 for Dayton Chamber members, and $30.00 for future members. Event will be hosted at the Dayton Metro Library Northwest Branch, 2410 Philadephia Dr. Dayton,Ohio 45406.